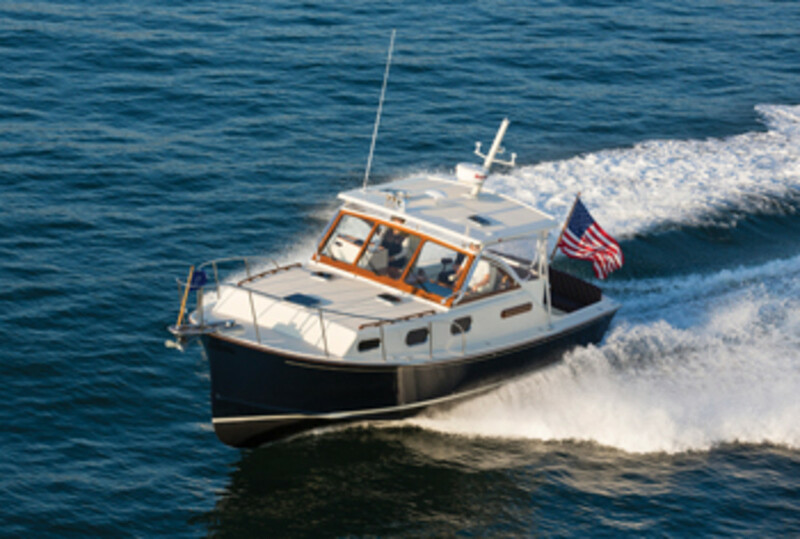 Rod Fortier, owner of Fortier Boats in Somerset, Massachusetts, is a let’s-get-down-to-business kind of guy. He doesn’t much like to be interviewed, and he refuses to be photographed. His father, Roger Fortier — the company’s founder, who died in 2011 — wasn’t much for photographs, either. But the younger Fortier, seated in his second-story office with a panoramic view of the Taunton River and the town of Fall River across the water, doesn’t want to talk about any of that. He also doesn’t want to discuss the yard’s nearly half-century history or any of his personal recollections. He wants to talk about the Fortier 33, the focus of his marketing efforts. The value of Fortier powerboats, he says, is in their timelessness. 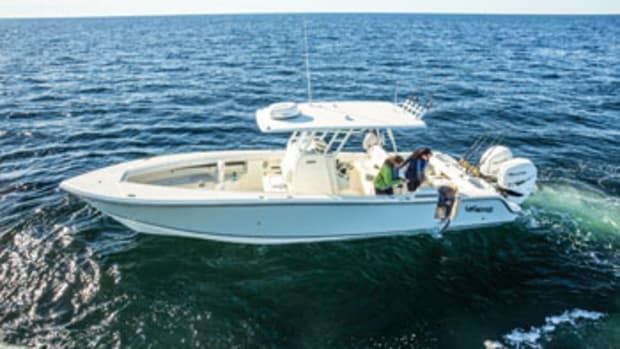 The 33, like all of the yard’s designs, is rugged, handsome and seakindly, and cruisers as well as anglers have coveted its lines for decades. “Look at that 33 from 20 years ago,” Fortier says, pointing to a photo on the wall. He turns to another photo of a 33, this one behind his desk, shot a couple of years ago. The picture is glossier and the colors are truer, but there’s little difference in the subject. 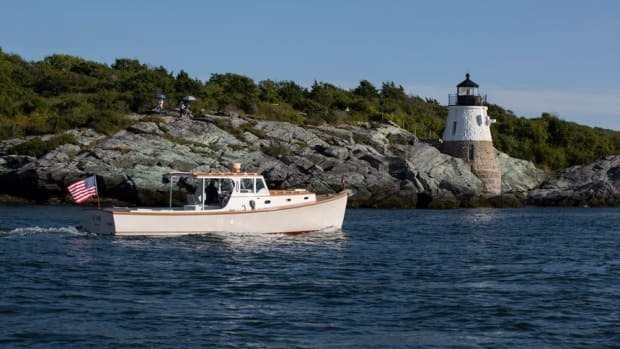 Founded in the 1970s, Fortier Boats builds semicustom fiberglass vessels based on the designs of Eldredge-McInnis, a naval architecture firm that operated in Boston until 1976. 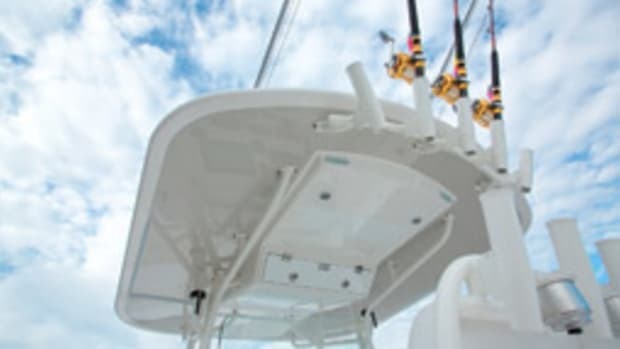 The yard has turned out more than 500 boats, mainly pleasure cruisers and sportfishermen, at a deliberately restrained pace that now amounts to three or four boats a year. 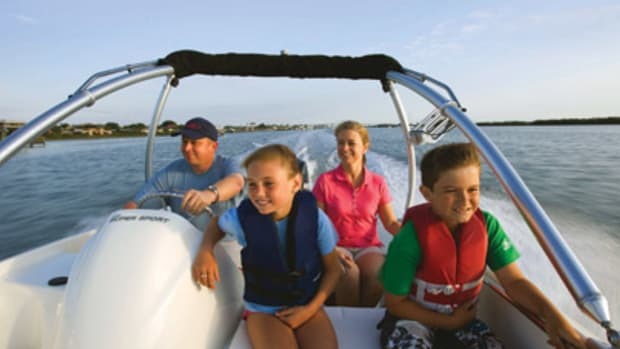 Clients tend to be repeat buyers — younger ones looking for the next step up, and older ones ready to downsize — who use their boats on both coasts and in the Caribbean. Some of the craftsmen building Fortiers today have been around almost as long as the shipyard itself. I watch as lead foreman Mike Lachance stands on the staging behind the transom of a Fortier 33 for a first-time customer. 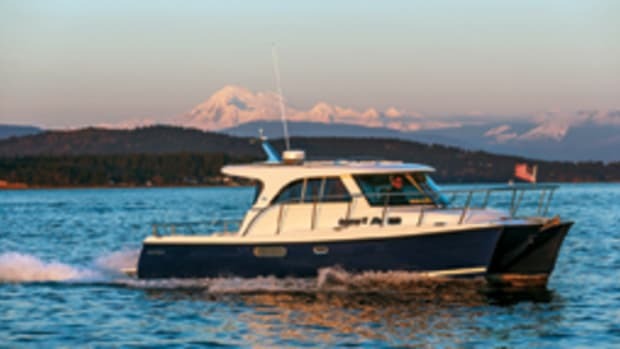 Lachance has been with Fortier Boats for more than 30 years, having landed at the yard out of high school. Others have been around for 15 years or more. One started years ago, left for a while, then returned. Today, Lachance is building a swim platform to the tune of classic rock. Another 33 is also in build, expected to launch in time for the autumn boat shows, and an older 33 is here for a new electronics package. A 40-footer receiving work on its deck plug will be delivered to an owner who is upsizing from his Fortier 33. Feelings Mayers, dressed in a white Tyvek jumpsuit and a blue bandanna, is maneuvering in the companionway of a boat named Minnow, whose flag-blue hull shows off beautifully crafted wood trim and gleaming hatches. Launched in 1994, Minnow returns yearly for storage and service. The woodwork will be varnished, the hardware buffed. Rod Fortier, of course, grew up with the business, too. His father began as a contractor known for the homes he built in the Pilgrim Hills section of Somerset. Both of Rod’s parents were enthusiastic boaters and longtime members of the New Bedford Yacht Club, where they served as commodore, board member and fleet captain. Rod learned to sail through the club, spending summers on the water and enjoying time aboard the family’s powerboats and then a sailboat. The Fortiers bought the plans for a 26-foot wooden powerboat. Friends in the fiberglass business helped them build a plug and a mold. They launched hull No. 1 in 1976. 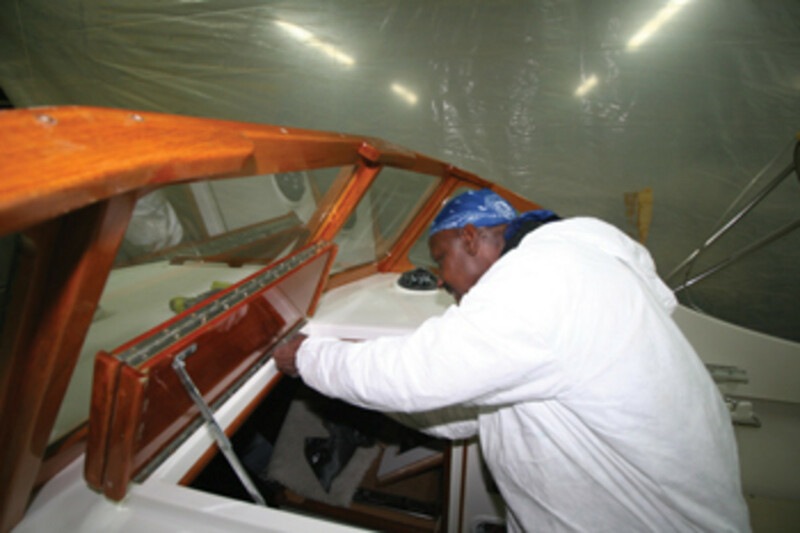 Roger at first continued building houses and, with Rod, began turning out one or two boats a year. The new business thrived. 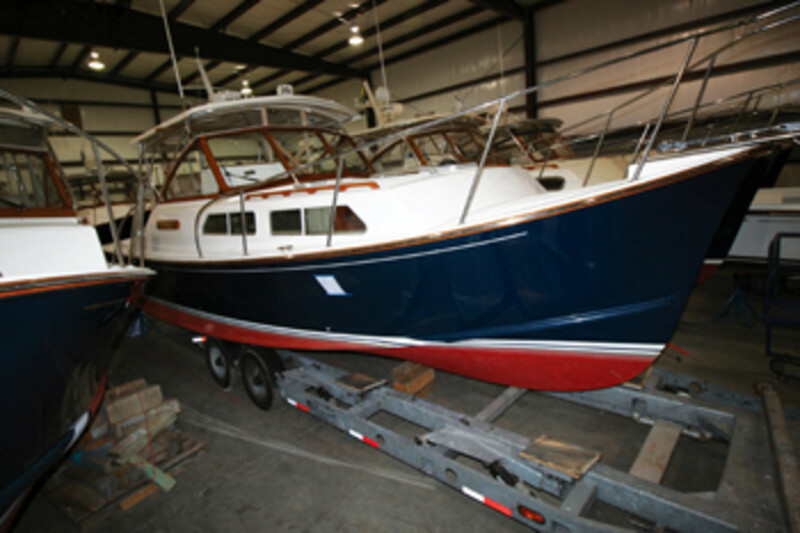 Fortier Boats incorporated in 1977 and sold 11 boats its first year. By the time the hulls hit the boat show in Boston in 1978, they were already sold out. The family would become part of the centuries-old boatbuilding history in Somerset, a town filled with reminders of the Colonial era: narrow streets whose homes date fromo the 1600s and 1700s, stories of sea captains and clipper ships, grave markers for Revolutionary War veterans. The remains of old stone wharves jut out along the Taunton River, prime locations for long-gone shipyards, iron manufacturers and potters’ works. Shipbuilding on the river began in the 1690s. The Fortier Boats site was once owned by B.B. Crowninshield, a man from a wealthy Massachusetts family with long-standing ties to the sea who in 1917 established Crowninshield Shipbuilding. 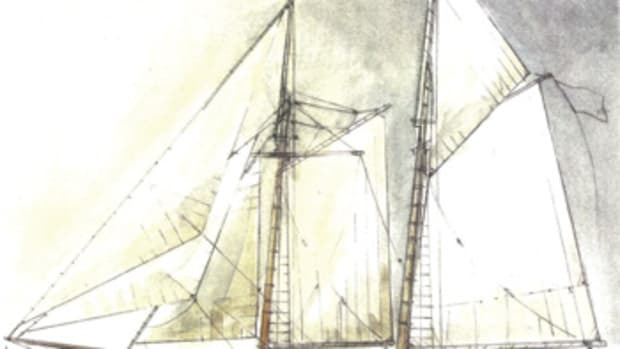 According to Designs to Inspire: From the Rudder 1897-1942, by Anne and Maynard Bray, Crowninshield built tugs and designed the America’s Cup contender Independence, along with the Dark Harbor 17½-foot sloop. Designers who would go on to make names for themselves, including John Alden and William Hand Jr., got their start with Crowninshield. Today, the site where Crowninshield once laid keels belongs to two boatbuilders: Gladding-Hearn Shipbuilding, which has been producing steel and aluminum commercial vessels for more than 60 years, and Fortier Boats. Rod Fortier says the property once had a boathouse that a hurricane wiped out, possibly in 1938, as well as an L-shaped building that washed across the street in another storm. The Fortiers built it all back in the same configuration, but out of cement blocks. At some point, the facility became Somerset Boatyard. The Fortier family lived just up the street, so Roger stored the family’s boats there. They bought the property in the mid-1980s, further adding to the family’s legacy in Somerset, which once was home to Rod’s grandfather, the home-builder Archille Fortier. (Both Fortier Street and Arch Street are near the yard). For Rod, boatbuilding was all he ever wanted to do. 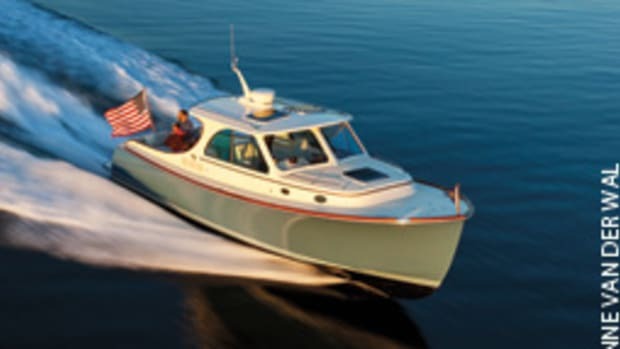 He likes to quote a squib from Nautical Quarterly, which described Fortier boats as being “designed by a fish.” The yard builds in four sizes — 26, 30, 33 and 40 feet — using hand-laid fiberglass, a Core-Cell foam core, stringers from bulkhead to transom, and molded-in keel and spray rails. 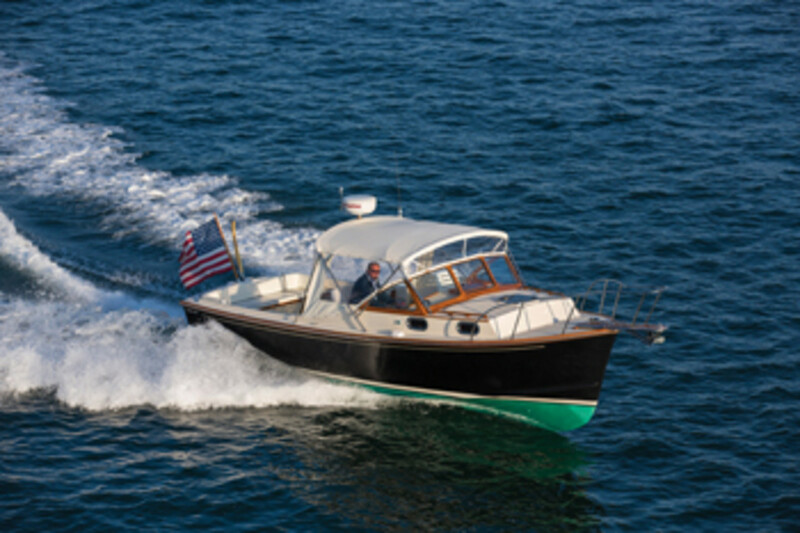 Fortier hulls are stiff and stable, with a soft, dry ride and a reputation for handling short, choppy seas with reduced pitch and pound. Custom teak — used throughout for trim, windshield and rub rails — plus wood soles and trim below enhance the traditional look. The boats feel substantial, too: The 30, for example, has a cockpit that’s approximately the same size as the one on the 33. Accommodations are designed for day trips or overnights. Boats can be customized with options that include electronics and Volvo Penta IPS power for speeds up to 32 knots with joystick handling. 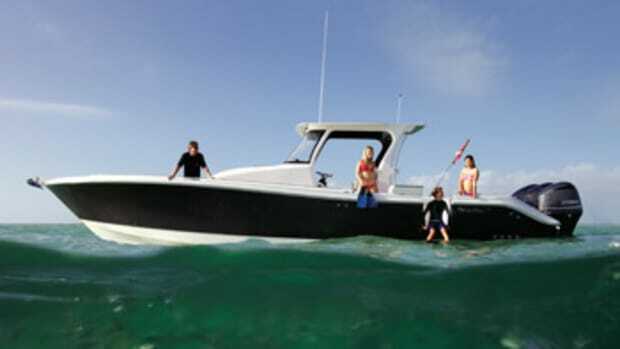 Fortier Boats keeps its prices reasonable, Rod says, by operating with low overhead — no sales or office staff. And across the street is the yard’s storage and service shop. Fortier 33s are lined up in front, with the 30s in back. They look muscular, ready to leap out the door for a day of cruising the coast or working the fishing grounds.